The Company has selected independent engineers Moose Mountain Technical Services (“MMTS”) and SRK Consulting to lead the feasibility study (“FS”). The FS is nearly complete and is anticipated in 2018. The FS will incorporate the positive results of ore sorting tests that were reported on July 16, 2018, as well as several other opportunities that were identified in the FS work program. As reported previously, Almaden is also in the final stage of preparing an Environmental Impact Assessment (Manifiesto de Impacto Ambiental or “MIA”) for Ixtaca, and is incorporating the most recent updates contained in the FS, into the MIA. Almaden expects to submit the MIA this year. 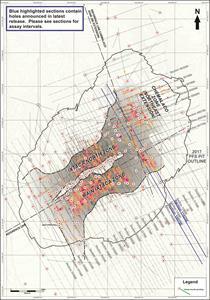 The Ixtaca Zone is a blind discovery made by the Company in 2010 on claims staked by the Company. The deposit is an epithermal gold-silver deposit, mostly hosted by veins in carbonate units and crosscutting dykes (“basement rocks”) with a minor component of disseminated mineralisation hosted in overlying volcanic rocks. The Ixtaca deposit is located in a developed part of Mexico in Puebla State, the location of significant manufacturing investments including Volkswagen and Audi plants. The deposit is accessed by paved road and is roughly 30 kilometres from an industrial park with rail service where significant manufacturers such as Kimberly Clarke have facilities. Any potential mining operation at Ixtaca would be located in an area previously logged or cleared with negligible to no current land usage. Mr. Norm Dircks, P.Geo., a qualified person (“QP”) under the meaning of NI 43-101, is the QP and project manager of Almaden’s Ixtaca program and reviewed the technical information in this news release. The analyses reported were carried out at ALS Chemex Laboratories of North Vancouver using industry standard analytical techniques. For gold, samples are first analysed by fire assay and atomic absorption spectroscopy (“AAS”). Samples that return values greater than 10 g/t gold using this technique are then re-analysed by fire assay but with a gravimetric finish. Silver is first analysed by Inductively Coupled Plasma - Atomic Emission Spectroscopy (“ICP-AES”). Samples that return values greater than 100 g/t silver by ICP-AES are then re-analysed by HF-HNO3-HCLO4 digestion with HCL leach and ICP-AES finish. Of these samples those that return silver values greater than 1,500 g/t are further analysed by fire assay with a gravimetric finish. Intervals that returned assays below detection were assigned zero values. Blanks, field duplicates and certified standards were inserted into the sample stream as part of Almaden’s quality assurance and control program which complies with National Instrument 43-101 requirements. 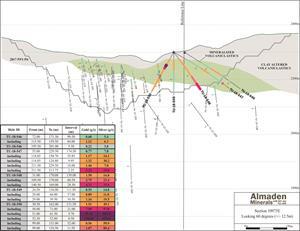 Almaden Minerals Ltd. owns 100% of the Ixtaca project in Puebla State, Mexico, subject to a 2.0% NSR royalty held by Almadex Minerals Ltd. 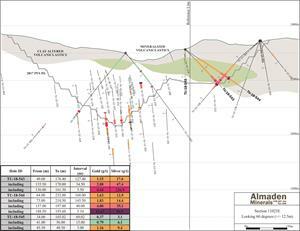 The Ixtaca Gold-Silver Deposit was discovered by Almaden in 2010. Neither the Toronto Stock Exchange (TSX) nor the NYSE American have reviewed or accepted responsibility for the adequacy or accuracy of the contents of this news release which has been prepared by management. Except for the statements of historical fact contained herein, certain information presented constitutes "forward-looking statements" within the meaning of the United States Private Securities Litigation Reform Act of 1995 and Canadian securities laws. Such forward- looking statements, including but not limited to, those with respect to potential expansion of mineralization, potential size of mineralized zone, and size and timing of exploration and development programs, estimated project capital and other project costs and the timing of submission and receipt and availability of regulatory approvals involve known and unknown risks, uncertainties and other factors which may cause the actual results, performance or achievement of Almaden to be materially different from any future results, performance or achievements expressed or implied by such forward-looking statements. Such factors include, among others, risks related to international operations and joint ventures, the actual results of current exploration activities, conclusions of economic evaluations, uncertainty in the estimation of mineral resources, changes in project parameters as plans continue to be refined, environmental risks and hazards, increased infrastructure and/or operating costs, labour and employment matters, and government regulation and permitting requirements as well as those factors discussed in the section entitled "Risk Factors" in Almaden's Annual Information form and Almaden's latest Form 20-F on file with the United States Securities and Exchange Commission in Washington, D.C. Although Almaden has attempted to identify important factors that could cause actual results to differ materially, there may be other factors that cause results not to be as anticipated, estimated or intended. There can be no assurance that such statements will prove to be accurate as actual results and future events could differ materially from those anticipated in such statements. Almaden disclaims any intention or obligation to update or revise any forward-looking statements, whether as a result of new information, future events or otherwise, other than as required pursuant to applicable securities laws. Accordingly, readers should not place undue reliance on forward-looking statements.